Home Invest	Diane Kennedy Interview Exclusive! 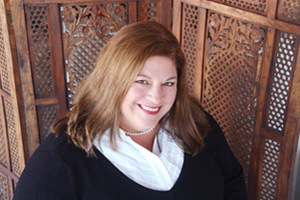 Brian: We have the real number-cruncher joining us on the program today, along with a book that she’s just released and it has received phenomenal reviews. But better than the reviews: fire sales. Almost like the sales of real estate in Sydney Australia. 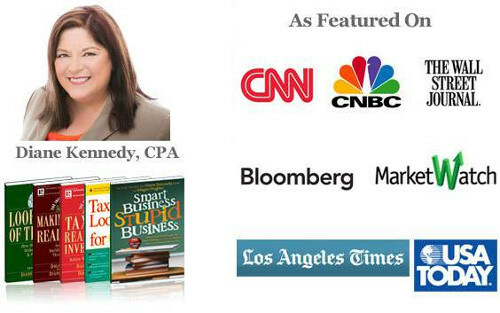 Please welcome to the program Certified Public Accountant Diane Kennedy. And Richard you are the one that went out and found Diane and found the book. 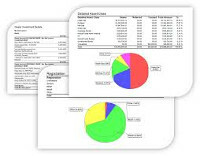 And considering what we talk about here on the program – offshore tax guide; and people looking for the best breaks that they can find: You found the right person and it looks like we’ve got the right book. Richard: Yes and of course we’d have to thank Escape Artist internationally for linking up and letting us know about Diane. Diane I know you’re on the line: Welcome to our radio show which we call Lifestyles and Real Estate of the South Pacific. It’s great to have you on board, and boy am I glad! I have some questions for you. I let people know last week that you were coming on and I’ve got about 5 questions for you which we’ll go into shortly. They’re people who have said, ”Please ask Diane this,” and “Please ask that!” so welcome to the show Diane. Diane: Thank you for having me. You know, it’s exciting this book; its interesting. The Offshore Tax Guide is the name of it. And I wrote it because my clients had so many questions. And I so thought “You know what? I’m just going to write a book about this.” …and so I did! And it was kind of crazy how many people reacted to it. We sold out the first printing in 4 days. So we’re getting the printing presses going and getting the next runs out. But its interesting to see when a book that I really didn’t think was going to take off that much, actually does. It tells me how many people right now are interested in what happens when you move yourself and your business offshore. And how do you do that legally and actually like I say, practically tax-free? Richard: Well I think there’s an enormous need and I think you’ve hit the niche. And you’re fulfilling it because I know from our show we’ve been running for a couple of years we just have lots of people who are frustrated looking for that next step in their life. Diane: (laughs) You maybe need to look that up in the dictionary and find out what exactly ‘free’ means, because its not free and easy, that’s for sure. And it does cost money. But yeah I’m sure you’ve got great questions I just need to add a point here though. The thing thats just rocked our world is something called FATCA – Foreign Account Tax Compliance Act; F-A-T-C-A. And that went into effect July 1st 2014. And for Americans this is a big thing. There’re a lot of people who don’t understand it; and are misusing it; and making it harder than it needs to be. Diane: Oh you know I think the number one thing is to just make sure that you’re doing the reporting. And I think more than anything thats what this new rule FATCA brought about. There’re some pretty steep penalties including even jail time if youre not reporting. 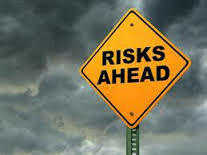 Now it doesn’t mean you have to pay tax; but if you have assets offshore that are reportable you need to make sure youre reporting those to the IRS. Now interestingly enough there are two asset classifications you don’t have to report. One of those is Real Estate and you know Richard, Brian and I go back way back. He knows I’ve always loved real estate, and international real estate I think is even better than that. And you don’t need to report it. So it’s the ultimate in privacy. Richard: I like that one. Brian: That was because Richard is an international real estate developer. Brian: And with what Richard is working on in Vanuatu and what he’s done in Australia; I mean its almost like giving candy to a baby. Diane: (laughs) The thing is that I’ve got clients who ask the same; you know you asked me for the ‘one thing’ and I’ve got to say it’s ‘knowing your reporting.’ I have a lot of clients that are internet marketers – you know ecommerce online businesses, and thats probably one of the easiest businesses to move all or part of it offshore. And in the Tax Guide I go through ”What do you do if you’re moving your business,” How to legally set that up so you don’t have to pay US tax on it. But one of the key points, and this is important for Americans to hear, is that if you’ve made money offshore, then as soon as you bring it back to the US it becomes taxable. So what we need to do with the offshore businesses is to look for what investments can that business make. So then you try to keep money offshore and you keep your assets offshore. And that just goes hand in hand with the idea of buying precious metals, or as I like, international real estate. And with that you create cash flow offshore. So theres a lot of good things that can happen with it. 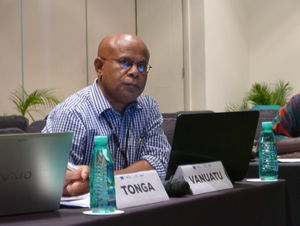 Richard: You probably don’t know this, but Vanuatu has just recently with the South Pacific Communication Cable in February/March of this year, actually got a submarine cable come in with direct fast internet connection to the world. Richard: And we’ve gone from satellite phones to 4G. So here we have one of the smallest nations in the world, it only has 250,000 people, with super modern communications. Its a third world country spread over 83 islands. And all of a sudden we’re only 49 milliseconds away from the markets of New York, London, Shanghai, Singapore. Richard: Yes,suddenly we’ve become a viable alternative lifestyle, where you can effectively be in touch with via the laptop. 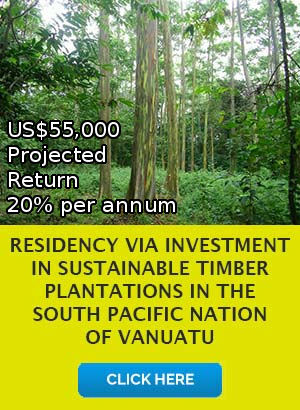 And of course I see this as amazing a new clean industry that Vanuatu can welcome. And this is one of the reasons why I’ve asked you to come onto the show; to actually be able to have our clients contact you and discuss it with you on a personal basis. If you’re happy with that? Diane: Absolutely. The best way to get me is through my website US Tax Aid. Thats T-A-X-A-I-D dot com. 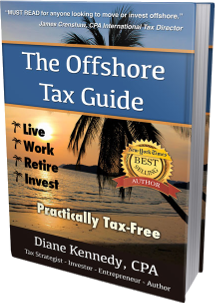 Go to USTaxAid.com – you’re going to see the book The Offshore Tax Guide and you’ll also find a place that you can ask me questions or set up a consultation appointment. We are a national firm but we work virtually with all of our clients, our CPAs across the country, and we have clients around the world. 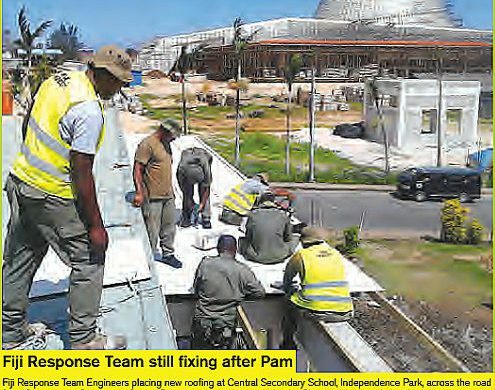 So we’re used to working with people in remote areas. We love Skype and so it becomes a great way to communicate with our clients. Richard: And; you’ve got a great story yourself Diane, you actually live offshore. You found your piece of paradise in the world I believe. Is it Baha where you are at the moment? Diane: Yeah. Actually at this very moment I’m sitting in Reno, Nevada. But we divide our time between Reno and Baha, California, which is – for people who don’t know – part of Mexico and it’s the peninsula that stretches down below California. We’ve gone back and forth, we worked 4 years full time in Baha California. And I’m yearning to go back because let me tell you living out by the beach and being able to find somebody to clean your house, and do the garden, and walk your dogs, and do all of that for just a fraction of what you would pay in the US if you could find somebody to do that. Richard: This show is called Lifestyles and Real Estate of the South Pacific and we have this sort of great opportunity in Vanuatu because it is first of all a tax friendly country. And it’s a third world country so you know the average hourly rate is only a $1.80 to $2 an hour. Brian: I want to go down the two roads. I’m a home-based business operator; also I’m a real estate investor. You guys can guess where I am going. If you don’t mind I’m gonna ask some of the questions dealing with the self-directed IRA, and I know Richard has his own questions that he wants to ask you. First of all – can I use my self-directed IRA? Can I use a 401k to invest in overseas businesses and/or real estate? Diane: The answer is yes. And then I absolutely underscore it. You know its so interesting that I run into people who say, “Oh you cant do that!”  Yes you can. In fact it’s quite open on what you can invest in. There are a couple of things you can’t; it’s collectibles and life insurance. 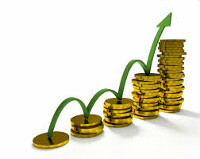 Other than that, absolutely you can invest in foreign assets. Brian: It is amazing. A lot of folks don’t know about self directed instruments. So I think thats one of the great things about Randy, he’s done a lot of research and he’s brought it forward on the program. Richard talks a lot about Vanuatu. Australian real estate has gone through the roof. I don’t know if you watch it at all but the median price in Sydney Australia for the past several weeks at these auctions that they hold is over a million dollars… median! Diane: I have good friends in Sydney and I’ve been watching what they’ve been doing- they’re doing great. Brian: What would you suggest to the United States person that may or may not have ties in Australia as far as – how to guide them into getting a foothold into that market? Diane: Thats an interesting question. I would say first of all – I think because Americans in general have gone through a hard recession in the US and real estate prices really went down… I think theres an inclination to look at that, and think the rest of the world’s in a recession. And its not. And so if they’re looking to get into another country they’ve got to find some advisors who really understand it. I mean personally I would look for somebody who is an investor themselves and understands not just the market but understand the numbers that have to go into a good deal. Richard: You know thats very true. I’m a numbers man Diane so I agree 100% with that. And the openings are there. You know I am talking to people as you are I’m sure. All around the world at the moment and especially from Europe and America, people are looking for a place to go. I originally come from New Zealand. We have a lot of New Zealanders living here in Sydney. And if you had a bought a house in Sydney 2 years ago you would have made a quarter of a million Australian dollars on your house. Just in the last 24 months. $125,000 a year is what we’ve gone up in the last 24 months. And it won’t stop. I can remember – I’m sure you can as well – the property prices 20, 30 years ago. I used to think there would be an end. But it’s all relative, and with more people and less property being developed than ever before the pressure stays on. And of course high-rise apartments, thats the big thing here in Australia. We’re all about going high-rise. And Chinese investment money in Australia is absolutely booming down here as well. So its a good time to be an international investor isn’t it? When you really think about it. Diane: It’s interesting that globalization makes us more secure. I mean you don’t really need to diversify even out of the real estate portfolio, just to be building that outside of your own backyard. In that way we can say if the US goes through a decline ever again like it did before, to have other real estate thats on the incline is a security. For example we’ve talked a lot about Third World Countries and how they’re developing. Those can be great deals because they’re just going to get stronger and better. 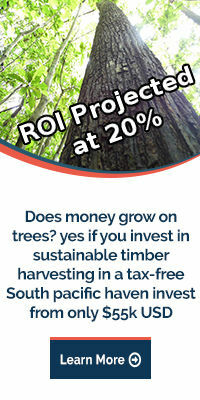 So creating that diversification I think is great investment advice. 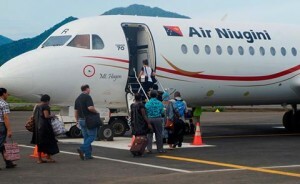 Richard: And as an emerging nation Vanuatu’s figures are quite incredible. You know it’s only a little place. The two places that are smaller than us are the Vatican and Nauru Island and we’re having vessels coming in from all around the world: from Asia, America, the UK, Russia. A lot of Russians are looking at coming into the South Pacific. Richard: At the moment all these people are requiring the advice that you can provide. And as I’ve said before we’re going to get Randy on the show. 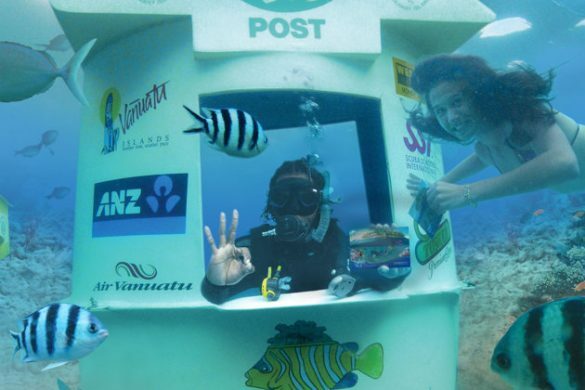 We have to talk about his personal quest of moving down to Vanuatu and having good advice. Richard: I’m of the simple belief that money doesn’t make the deal: good advice makes the deal and the money helps. Diane: (laughs) That makes sense. Richard: I’ve just returned from China. 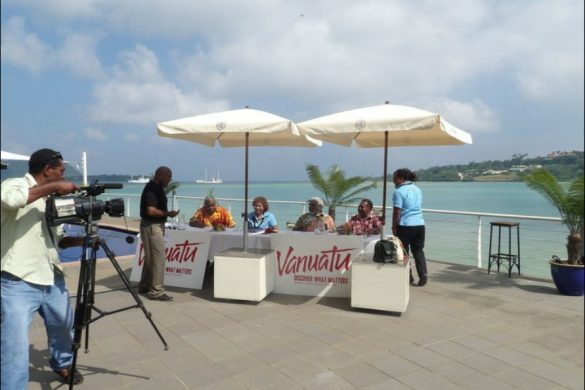 I had 7 days out there and I was representing the Vanuatu government in the Trade Commissioner position that I hold. I visited 7 different 5-star hotels there and one of them was in a high-tech park. And when we’re driving in it’s called Samsung Park and about 140 kilometres inland. And there was a sign that said “72 square kilometers.” And I went, Oh it must be 72 kilometers to go. And they said, No: The park is 72 square kilometers! Richard: Yes, it’s a high-tech park. And they had a lake in it that’s 14 kilometers long and a Hyatt Regency Hotel. And the Hyatt Hotel rents 60,000 rooms a year to Apple employees. Richard: Now those sort of figures are just unbelievable. Imagine having a hotel where Apple takes 60,000 rooms every year from you. That is just a licence to print money you know. Diane: Yes, there are so many things happening around the world. Its an exciting time to be alive. I think more than ever before we have access to what’s happening. 30 years we didn’t have the internet the way we have today. 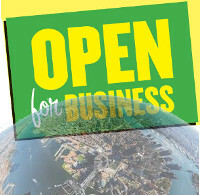 The world is open – it’s open for business. Richard: It absolutely is, and Vanuatu of course is my place as well as Australia. But we’re so open at the moment with people coming in from all around the world. Well Diane I have to send you some more information on Vanuatu. Richard: And you have to get more information; I’d love to talk about your background too but we just don’t have time today. I’m sure you’ve got some stories here to tell us. And wed like to bring you back. Is it possible that we might be able to get you back maybe for a segment for next weeks show as well? Diane: That sounds great. Now that I’m back from my crazy travel experience we’re much more stable now and I’d love to talk again. Richard: So we’ll get you back and well have Randy come on as well Brian if thats okay. Richard:: Well I’m working a lot harder in the show this week. Of course we’re missing Brian. Brian’s on holiday at the moment. Good on you Brian, thanks for all your help during the year. Diane: Thank you for inviting me. Richard: We’re really pleased to have you. As I said to you before the start of the show – I’ve been accused of being a sexist by having too many male interviewees. And so you’re actually helping me basically shift the scales back in the right way. Richard: Now, the accounting business. Seems to me – I may be wrong but it does seem – to be heavily weighted with more men accountants than lady accountants. Is that correct? Diane: Well it’s funny, you bringing up that subject. I’m not going to say how old I am. I just always tell people I’m 39 plus shipping and handling. Diane: (chuckles) I went through accounting school. And in the US you can go out and be an accountant and you can work for companies in doing financial statements, etc. To be a CPA is another step. At the time that I became a CPA you had to work a 2 year internship where you got paid, but you were the lowest paid person at the company. You didn’t get paid overtime, and you made less than a janitor. So basically for 2 years you’re kind of like slave labour. And then at the end of it you have to pass this very hard test. And with that you can become a Certified Public Accountant in the US. And I’ll tell you I had interned at the power company – the local power company when I was going through college. I need to go get those credentials, and especially at the time I did it because it’s been a little bit ago since I got my CPA. It was very rare. There was maybe only one in the the city of Reno, Nevada – where there are probably about quarter of a million people – and there was only one CPA female partner in all of the accounting firms. So it was kind of unusual. And for me that told me it’s going to be hard trying to climb up the ladder where I’m at. So I’m going to start my own business. And plus I’m kind of a maverick anyway. So I wanted to do something that was different and where I had the freedom to build a company exactly the way I wanted to do it. 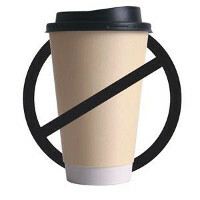 So that’s the story on why I went ahead to get a CPA – because I didn’t want to bring coffee to the meeting. Also because I couldn’t – one of the people who first helped me get my business going – in fact he made me a business loan – he told me I was an awful employee and so I’d make a great business owner. So there you go; that’s how I became a CPA with my own firm. Richard: Diane that sounds excellent. I understand what you saying about being a great business owner. I have a couple of friends that have been in real estate development for 20, 30 years and they’re totally unemployable! Nobody else could ever afford them anymore. Richard: Because you just would not be able to be in the same room with them. They’re so overpowering, and I say to them, “you’re unemployable”. And they might get really offended about that you know, but it is true. You get to the point where you’ve been running your own business for quite a long time. “Leader “is another word I would use. Richard: An “out of the box” thinker. And I actually have been saying to people that you know when you move from your mother country and you want to have a 2-flag policy say from America to Vanuatu: you know you’ve got to be a can-do thinker when you do these sorts of things. You can’t be a follower. You have to be a can-do thinker. You’ve got to get out there and make the opportunities happen for you. And I think there’s a great realization amongst a lot of people who have been running businesses for a long time that there could possibly be a better way of doing things. And you found that way didn’t you after being a CPA? Richard: You then found that you could operate outside of the States, outside of America, and you went to Baja which we spoke about before. How did that arrive on your front door-step so to speak? Diane: You know there’s another stage in there. And I built up a more customary practice – what we call a “bricks and mortar” practice. You know the building and all of that. And I was working really, really hard. But I sold my business in 1995. That’s been a while ago. And what I did is, I kept just a handful of clients because I really wasn’t ready to retire. But I was tired of the grind, working every day, driving to the office, and doing all that kind of stuff. So I kept a handful of clients. Well one of my clients was somebody who had just sold their international seminar company, and developed a board game that had to do with finances, and then wrote a book. And do you know who I’m talking about? You might know. The book was “Rich Dad Poor Dad” which went on to be an international best seller. 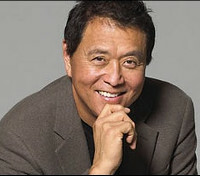 Diane : And this person is Robert Kiyosaki. So they were my clients before when they had the seminar company and they were building up all the real estate. Then he kind of retired… but he couldn’t retire. He had to get going and took me along with him. So that was like the second stage of my career where I learned a lot about building systems because I traveled with him. I spoke in Australia. I spoke in Norway and Sweden and all around the world. And I had to be able to leave the office. So it gave me a way of working differently and that opened up the doors. As technology caught up with that we went completely virtual. And now we have our CPA’s across the country. Nobody goes into an office unless they happen to have one themselves that they’ve rented. But everybody else is just “all on the internet” and that’s how we work. And that lead to, “Gee we can live anywhere.” And so in 2008 we saw the decline of real estate. My husband and I had always been invested in US real estate very heavily. And so what: we’re just going to have to ride this out. It’s not coming back anytime soon”. And we had a Baja beach house. And so maybe it’s time to retire at the beach? So that was my second failed attempt at retiring. (chuckles) And now we’re back again. Diane: When the market started turning we bought some property in the U.S. We saw some big gains and we needed to come back to the U.S. to manage some things here, but we still go back and forth to Baja now. Richard: This is very interesting. A high recognition you had working with him. And I can remember when the book came out I read the book . And I was a bit involved in property development since 1980. And I could relate to the “Rich Dad Poor Dad” situation because there always are mentors in your life. My father was a great guy and a very strong man and a great mentor. But later in my life I met another guy who was a property developer who mentored me and fathered me, for want of a better description, into real estate. So when I was reading “Rich Dad Poor Dad” I assimilated it. I thought it was a great book. I really enjoyed it. I haven’t read it for a while: I should read it again. But the world has been taken over, and the marketing has changed so much, hasn’t it? Richard: (laughs) And all of a sudden we’d find the energy to keep going. But I’d like to talk to you about seminars ’cause I know you’re doing a lot of seminars at the moment. Richard: And of course Randy’s coming on as well. He’s been holding 5 questions for a week: sitting on 5 questions to ask Diane about IRA’s and LAC’s. So Randy are you there as well? Randy: Yes I am. Good afternoon. Richard: Randy’s actually moving to Vanuatu. And so consequently he’s now one of the editors of “Escape Artist Vanuatu.” And so his specialty of course is he likes these IRA’s etc. So Randy what’s your first question if we can go straight to that? Randy: Well you know Diane I am an old accounting major and you know I received my tax software renewal. So it’s kind of got me to thinking about income taxes. And what do people need to do as we wrap up the year and kind of look forward to the new year in terms of their tax planning? Diane: You know we have 1 week left (chuckles) and so I have to get going fast. But I’ve got to say that at the last minute like this a lot of times what we’re looking at is starting to fund pensions. Now if you’ve got a business and you’re going to set up a business pension, make sure you have that set up prior to the end of the year. Because you need to have a sense of what kind of a tax bite you’re looking at. And maybe it’s time to go out and buy some furniture for the office or some computers. I don’t ever recommend buying something just to get a tax write off. But if you’re buying something anyway, maybe accelerate some of those purchases because you can then take the write off against the income in 2014. Randy: Right, Right. Well you know Diane a lot of people my age as we retire, of course we may have 401k’s or IRA’s but a lot of us also have pension plans. And as we go towards the end of our career typically we can take a lump sum or like a life time annuity. 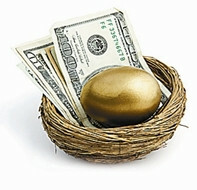 Is there a way that people can take their lump sum and rollover to an IRA so they can avoid that big tax hit? Diane: Yes; that’s such a smart strategy to do that too. I mean I’ve seen people that are leaving their job and they just take the 401k out and then they have to pay tax on it all. But instead just roll it over into something that you can self-direct. And once you have a self-directed IRA you’ve got a whole range of things you can invest in. In fact just about anything. Couple of things you can’t do – life insurance or numismatic coins, or collectibles in general; but other than that just about any thing’s available: the sky’s the limit. Randy: Well I’m certainly a big fan of the self-directed IRA’s and encouraging people to expand their horizons and look to the alternative investments such as real estate overseas. 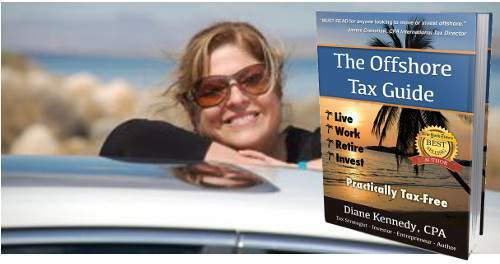 Diane as an expat in the making one of the big concerns for me is my tax burden here in the United States. As you go to take up a foreign residency the rules get kind of complicated. What are the basic guidelines in terms of having an overseas residence and your liability for U.S. taxes? Diane: That’s a great question. If I remember correctly you’re from Oklahoma right? Diane: Okay. ’Cause this is the number one thing to watch – what state are you leaving from? Because believe it or not there are some states – California is one of those – that if you leave from California, California will continue to try to tax you forever. 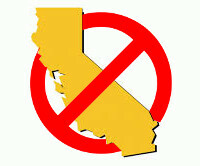 So if you’re in California one of the things we do is recommend that you move to another state that isn’t going to follow you. Oklahoma luckily is one of the ‘good states.’ They don’t follow you. So make sure what state you’re leaving from. Then the other part is, once you establish that residency in a foreign country, you know as an American… you probably heard, we’re taxing worldwide income. But we get a ‘foreign-earned income exclusion,’ and if you’re married that’s almost $200,000 this year. Plus you get a housing allowance that depending on where you are runs about 30 to $50,000 a year. So bottom line: you’re going to probably end up with tax-free money of $240,000 a year. In order to do that there’s 2 tests. One is the physical residence test which is – you have to be outside of the US for 330 out of 365 days. That’s a pretty objective test: it’s just counting the days that you’re out. The other test is a little more subjective. What that’s called is – having a ‘bona fide residence.’ And if you have that bona fide residence you can come back to the .US. Kind of the rule of thumb is usually about 120 days, up to 120 days a year in the US. Otherwise make sure you’ve got a visa. You know getting that permanent visa is just gold because that just get you right to the front of the line for the foreign-earned income exclusion. Randy: That’s interesting. I didn’t realize that. Even as an expat in the making. Randy: So people can still continue to collect their Social Security? I mean still can collect their social security as they move overseas. Is that taxable at all? I mean other than that just the normal possible tax consequences of collecting social security? Diane: Yes. Can they collect it? Absolutely. The only thing that they might not get – in the social security system there is social security that you’ve earned and then there’s also social security benefit that you might not have earned. For example – disability when you never really worked for and earned social security. The items that are – what do I say? – I don’t want to say welfare but the things that you didn’t earn. Those you cannot collect in a foreign country. But if it’s your social security account you absolutely can earn that. And as far as what’s taxable it will just follow whatever normal taxes are for the U.S. Probably because you’re getting that huge foreign-earned income exclusion my guess is it’s not likely to be be taxable. Randy: Right, okay. Hey just real quick: back to that bona fide residence. Randy: Now bona fide residence overseas will allow you to visit: come back and visit. Randy: Because I know that that’s 330 days out of the country but then if you come back and just visit. I mean so what’s 120 days again? Can you help me out there? Diane: Well, you bet. I mean this is exciting stuff! In fact I talk about this in my book “The Offshore Tax Guide.” But the two rules: the one is the physical presence and I think most people are familiar with that because that’s real easy. You count the days. How many days were you out of the country? ‘The country’ being the U.S. Bona fide residence though, is where you have permission in that country. So it’s not getting a touristy visa in another country. You have to have a permanent residency. And then once you’ve established that, and clearly shown that this is your permanent residence, you can still own a house in the U.S. but you’ve got a residence somewhere else. And that other property is like a rental or something else. And then, under that residency you can come back to the U.S. more frequently. As long as you’re demonstrating that it’s not because you live there. You know, you’re going there to visit your friends or your family . Or you’re doing something else there, it’s not to establish residency. Diane: Up to 120 days. Randy: Well okay: that’s a substantial amount of time because I just come and get to visit. If I was alone I’d limit it to only being able to come back and visit for 30 days. Still want to come back for holidays and things like that. Diane: Exactly and I have a friend and a client whose mother is very ill in Ohio and so she’s been concerned as they’re contemplating moving out just next year. Well you know, “What if mom gets real sick and I have to go back?” And it’s true that 120 days is a lot, so that really does help. Randy: Right. Well Diane, so I understand that you have a place on the beach as well. So is that down in Mexico? Diane: It is. Baja California Mexico. And it’s a peninsula that’s just south of regular California. Very laid back: on the Pacific Ocean. It’s a very surfer-dude kind of place. Randy: Well since you have a place on the beach I guess we might have a little difficulty enticing you to the wonders of the South Pacific. We’d certainly like to have you come and visit sometime Diane. Diane: We’d love to do it. Richard: Well we shouldn’t have too many problems enticing you because I for one am about to ask you to come down and bring a group of people, and have a big seminar down here. That would be the way to do it. Wouldn’t it Diane? Randy: I think that would be great! Richard: Yeah I’ll organize it. That’s the job for you, first job for you to do Randy, when you get down, is to start organizing that. This year for us has been absolutely amazing – the last 12 months we’ve had a complete turnaround and an uplift in property prices and business. It’s been amazing. I suppose Diane I’m noticing that America is having that sort of lift as well. I know that there’s all sorts of ideas and concepts that Obama’s put out but I can see things starting to move again in America. Diane: Yes. You know it’s interesting in the U.S., and I think it’s true globally as well but it depends on where you are. Our house – our personal residence in Reno Nevada – went up 35% last year. But Reno is going through a huge boom because Tesla, if you’ve heard of Tesla Motors, is doing their one-of-a-kind innovative factory here. It will be the second largest building in the world all run by solar and wind energy. So it’s kind of an amazing thing going on, it’s just bringing jobs like crazy. And I think that as people look at real estate you know they might ask me, “Does it make sense to buy property?” and the answer of course is, “It depends where you’re going and what you’re going to do with it”. Richard: Good. Well we’ve got strategies down here based around utilizing the promotion of Vanuatu because it’s such a tax-friendly country. There’s no income taxes, no corporate taxes, no gift duty, there’s no land tax. And on top of that it’s an emerging nation. So these two big boxes are ticked straight away. And the last box – it happens to be just the most beautiful location. 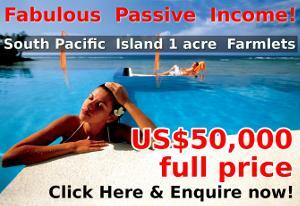 Ecotourism, clean industries, organic agriculture. And it just has that complete island feel about it… people are very, very friendly. 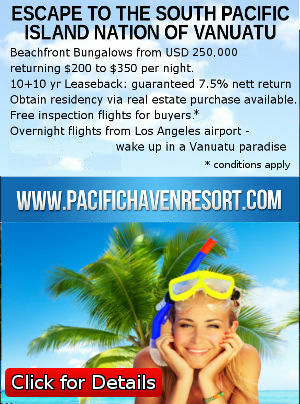 So I’ve got my plan for 2015 which is to continue to promote Vanuatu. But what is your plan for 2015 Diane if we can ask you? What have you got tucked away? happening in the U.S. There are a lot of people who want to move. And that for the tax, there is a lot that has to do with tax planning that does that. So you can end up really reducing your taxes. 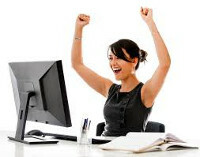 There are people that have now figured out how to take businesses online so they can work anywhere in the world. And at the same time there are a lot of people that are just kind of unhappy in general with the direction they see the U.S. going. And they’d like to just opt out. But for example last year there were 3 times as many people going through the expatriation process as there were the year before. Three times as many. And I think we’re going to just continue see that grow and grow. I personally I think it’s a great thing for people to think globally. 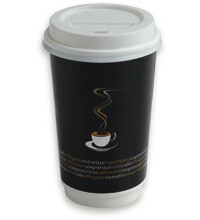 I see an emerging different way of doing business as we start to learn how other cultures and other countries interact. So I’m excited for the future. And I just want to stay there with them and talking about taxes. Richard: Well I’ve already signed up for your book but you’d sold so many of them I’ve got to wait for the second print run. Richard: Can you tell us first of all what it’s called and how we can get hold of it? And also can you also let the listeners know how they can get hold of you? Because this is one of the reasons why you’re on the show. Diane: You bet; well the book is called “The International Tax Guide.” And it just came out just a few weeks ago. We did our first run and sold out in 4 days. And then I happened to be in St. Maarten because I was speaking at a conference there on international tax and we didn’t get the order done. Anyway we’ve got a huge backlog right now. The order is in and we’ve got the books coming. We should have them probably the first of next week. But the book is called “The International Tax Guide”. You can get it at UStaxaid.com and that aid is spelt A-I-D dot com. And that’s also a great way to reach me. You can have a consultation with me. You can ask a question through one of my blogs. Lot of different ways we can interact. I’m just all about providing more information about domestic and international tax for Americans. Richard: Well Randy doesn’t that sound wonderful? We’ve now got our own personal how-to-avoid-paying-US-taxes-legally advisor. Richard: Well that’s exactly what we need isn’t it? Randy: Diane you hit on something that I get a sense of too is a certain disillusionment with things that are going on in the US – the heavy tax burden; and the trend of telecommuting; and the number of people who are now able to move their jobs online. And when you can work online then you can really consider things like internationalizing your life – setting up business in a place like Vanuatu. I think it’s just a great future for people who are willing to take that step and internationalize their lives. Diane: The other part I see is with families. We home-schooled our son. He’s now grown. He’s 23 years old. We had adopted our son from Mexico. And when we adopted him he had some language barriers and kind of socialization barriers. And so we decided, well the first few years we’re going to home-school him and then it became this great adventure. And David went to school. I mean he had some school in Argentina. And he spent time in Germany. And I think that’s just – my opinion – such a great gift to give your child. For people that are thinking “When my kids are graduated maybe we’ll think about it”. But why not spend a year or two in other countries and let them learn other cultures and different ways of doing business and new languages, and just new philosophies in life. I think it’s a great thing that’s available for a lot of people now. Randy: I agree with that. 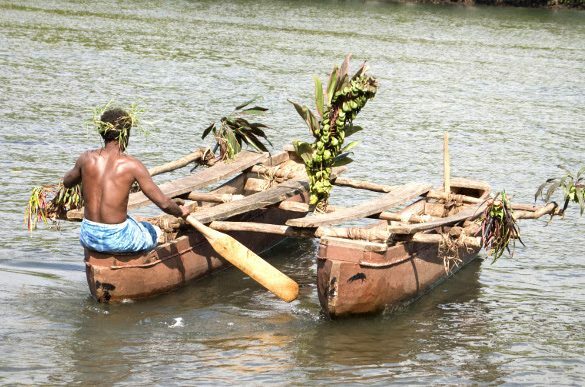 My family is joining me as I move to Vanuatu. And I think it will be one of the greatest experiences of their lives to be able to experience other cultures and things like that and at an early stage of their life you know. Richard: And the other one I had to go to Dubai. And Daniel was turning 19. So I said, “Why don’t you come here? I’ll take you with me and you can see very quickly how the two other great cultures in the world works.” So he got to learn the Asian culture in KL and the Arab culture in Dubai. And I remember I bought him a suit in Dubai which was just so cheap it was unbelievable. And he looked like a trillion dollars when he got off the plane when he came back. Richard: And you know it just changed his whole concept, because down here in Australia we’re very insular. We’re an island. You can’t just drive to the border and go over the border to another culture. We have as you know Diane, an amazing mix of race and population down here. But we don’t really experience the lifestyles that you can do when you go to another country. And it changed his outlook on life. And I firmly believe that everybody who’s involved in business should have a 2 flag policy at the moment. You’ve got to step away from things sometimes to be able to look back and see exactly what you have been doing. You’re still in the same rut year after year after year, you’re not prepared to look outside the boundaries or look outside the box, you eventually find that you’re winding yourself right up. That’s what I found in my business. I should have done what I’m doing at the moment 25 years ago. I know that today. Richard: And I can only give people advice. Get on a plane and fly somewhere. Have a look around. Let the world open up for you. Anyway I really want to thank you for coming on the show Diane. It’s been wonderful to have you. Richard: And you’ve also certainly given our listeners great stories to listen to all about taxes. Randy you’re in Oklahoma we’re looking forward to having you come down to Vanuatu in 2015. And of course David in Alabama, thank you for being our engineer for the year. And with that as I often say to people, “decision makers are profit takers.” So don’t forget that – buy something in 2015. All the best.